Title: Inspiring personal change through a geographical enquiry based on the Indian village of Chembakolli. Approach: We have been working to develop units of enquiry which integrate issues surrounding the Global Dimension with current Geography topics in school. This unit adapts a cross curricular approach including opportunities to develop thinking skills, writing, creativity and pupil choice. 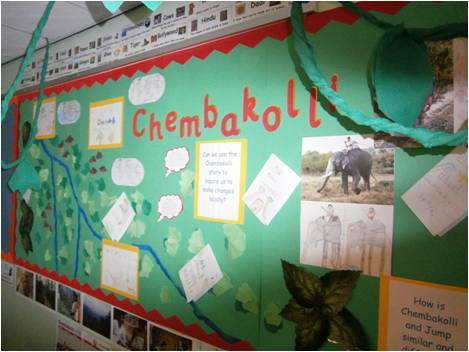 At the core of this unit are issues regarding global citizenship and change, using the story of the Adivasi people of Chembakolli to inspire change in school. continent, country, settlement, village, city, hills, rivers, weather, climate, monsoon, human, physical, landscape, road, route, distance, airport, homes, houses, farming, agriculture, crops, industry, market, key, symbol, connectedness, global, citizen, change. market town, economic activity, trade, cash-crops, occupation, remote. JumpPrimary School is situated on the outskirts of Barnsley, South Yorkshire. It is a small village school with a current intake of 236 pupils. We have a one form entry and accommodate pupils mainly from the surrounding area. However, there are a small number of pupils who travel to us from neighbouring communities. Jump is an ex coal mining village situated close to a number of woodland and park areas. The school is a focal point for the community and caters for a wide range of abilities. Children tend to enter school below national expectations, but by the end of key stage two the majority have reached national expectations or are significantly above.